Little is known about Abu Ibrahim Amriki, a US-born terrorist who was seen in this propaganda video released by a group calling itself the "German Taliban Mujahideen," which is based in Pakistan's tribal areas. 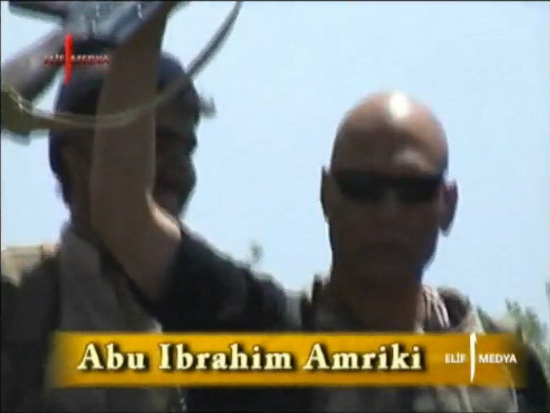 Amriki appears to be a leader or a popular figure; he is seen raising an AK-47 assault rifle while standing on the back of a truck, apparently addressing a crowd. The German Taliban Mujahideen is actually the Islamic Jihad Group, an offshoot of the Islamic Movement of Uzbekistan. The US killed Najmuddin Jalalov, the leader of the Islamic Jihad Group, in a Predator strike on Sept. 14.